Hello, my name is Ashley and I am on the Bat-Cam team! It’s almost been a month since the start of an adventure of creating an Integrated Underworld Camcorder. That’s right, a bat cam character from an online webtoon called Refund High School. A combination of bat features and camcorder features were developed together in concept to literally bring technology (the camcorder) to life (the bat). The process of designing and building such a concept has been approached iteratively. 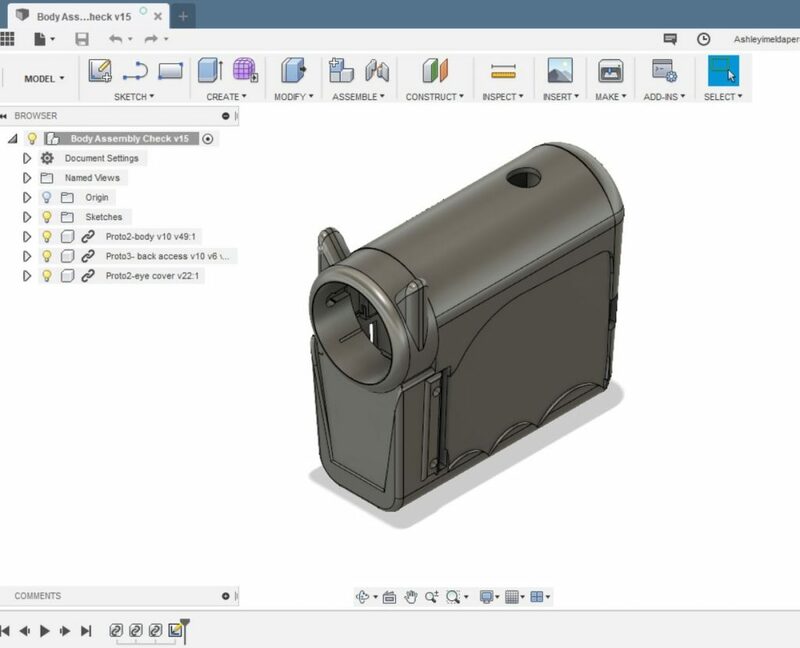 Using Autodesk Fusion 360’s CAD version control and rapid prototyping, the process of producing new prototypes and trying new design concepts every week has brought us to a weekly rhythm of continuous improvement. 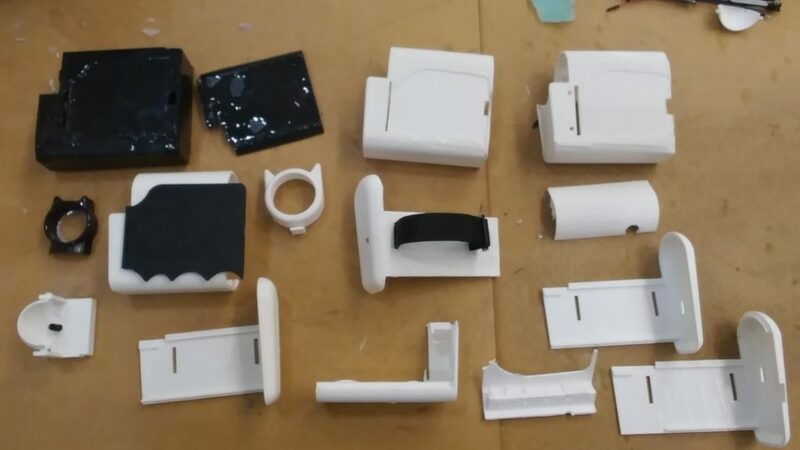 The benefits of using iterative design and rapid prototyping is the availability to make mistakes and learn through them in each iteration of the design. Using longevity prints from the Longhorn Maker Studio and Autodesk Fusion 360 CAD modeling to produce weekly results that are tangible and physically available for inspection makes the next design concept easier and easier to visualize. We are currently on generation 6 of our design. Alongside 3D modeling and fabrication, a large component of this project has been hardware integration into the camcorder body. Using Adafruit’s Teensy 3.1, an OLED, micro servo, solenoid, and tactile push buttons as part of the camcorder system called for small changes in design once the components came in. These changes included scaling the design to a larger form to allow for space for all components and adjustments to internal structure. 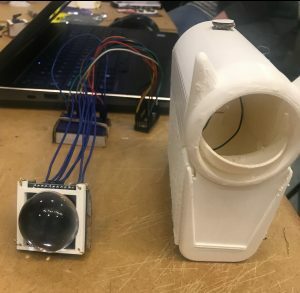 The process of integrating these hardware components into the system also involved an iterative approach that was much quicker to run through than the process of 3D printing the camcorder body due to wait time of 3D printing. 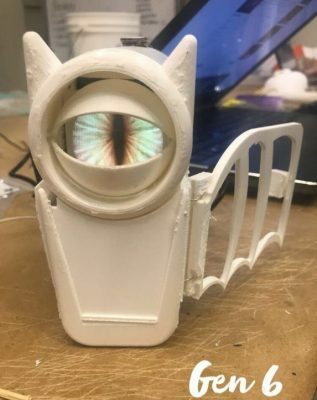 As mentioned in a previous post, the technology used to integrate animatronic features were taken from tutorials found online and modified for our purposes for this project. Running our system iterations through the Arduino IDE, we have developed a control for an on/off button and ‘zooming’ function using a joystick that makes our project interactive. The button hardware and internal mounting system are still currently under development and will be implemented soon. A large part of our design process in such an expedited design cycle has been hashing ideas into a priority list each team meeting to decide what changes are to be made in the following iteration and which ones to push back into later ones. This helps quicken the iteration process down to weekly results and although there are always issues that arise, the changes needed to be made are accounted for in the next iteration. More to come soon.